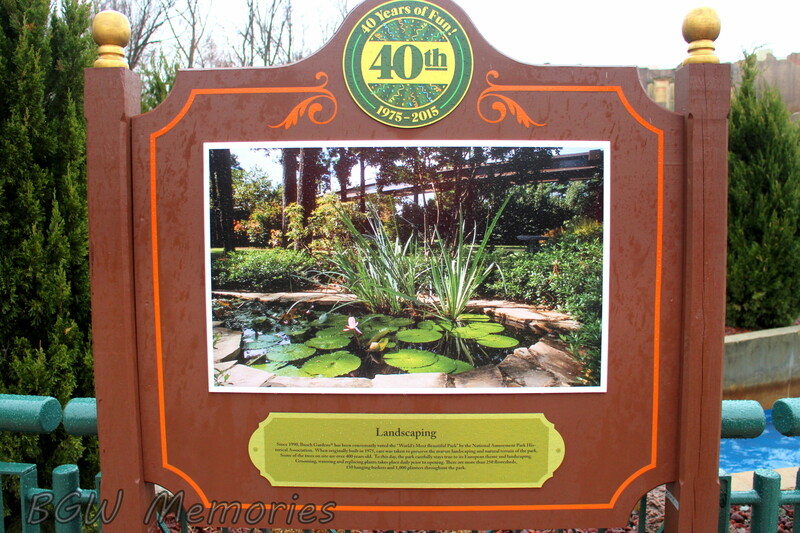 A collection of Historical Markers with factual information that celebrates the park’s rich 40 year history. Before you read this, be aware that this blog post is a labor of love. The quest was extensive and time consuming, but I could hardly resist the lure of finding so many cool facts and photos! 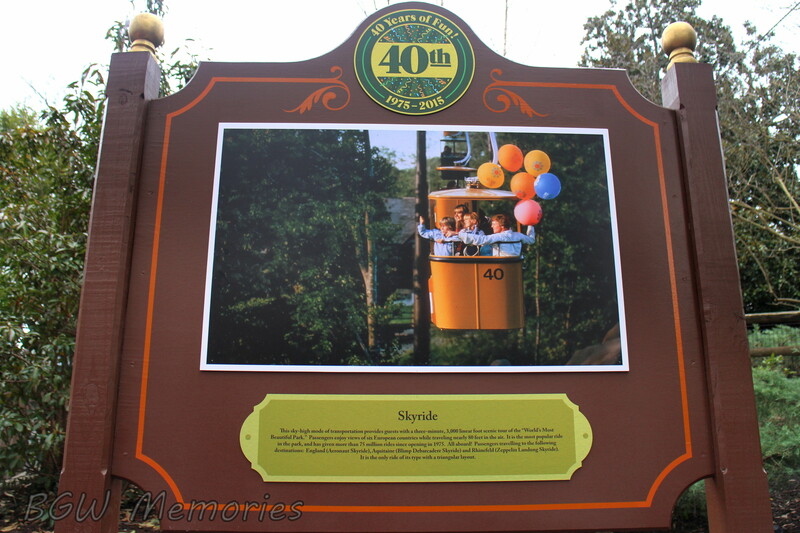 In case you haven’t heard, the park has scattered little nuggets of historical images and information around the park like a nostalgic Easter Egg Hunt. Hopefully, I found them all. I for one, was pleasantly surprised by the sheer number and quality of the signs. Someone took great care in the construction, documentation, and appearance of the displays. So, to those who worked on this project: I salute you! Some of you may not be able to visit the park this year. If so, I typed out each of the sign’s descriptions the park listed under each photo. I would have added the little trademark symbol as they do, but I honestly have no idea how to do that on the computer. Just imagine they are there. This may help provide a check list of how many there are. Spoiler alert: Some of them are really hard to find. It made for a fabulous form of exercise; so I have no complaints! 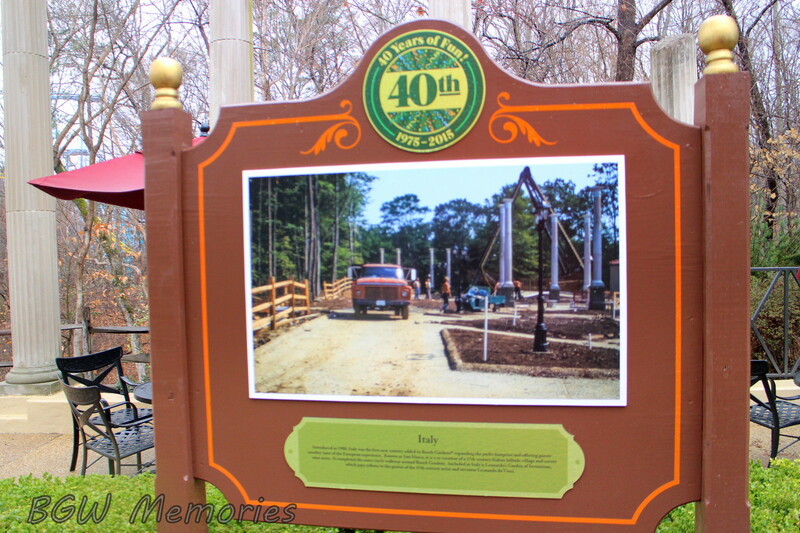 ~ A journey through time via Busch Gardens 40th Anniversary Celebration’s mega-awesome park signage begins. Tally Ho Adventurers! Your quest awaits! What’s in a name? 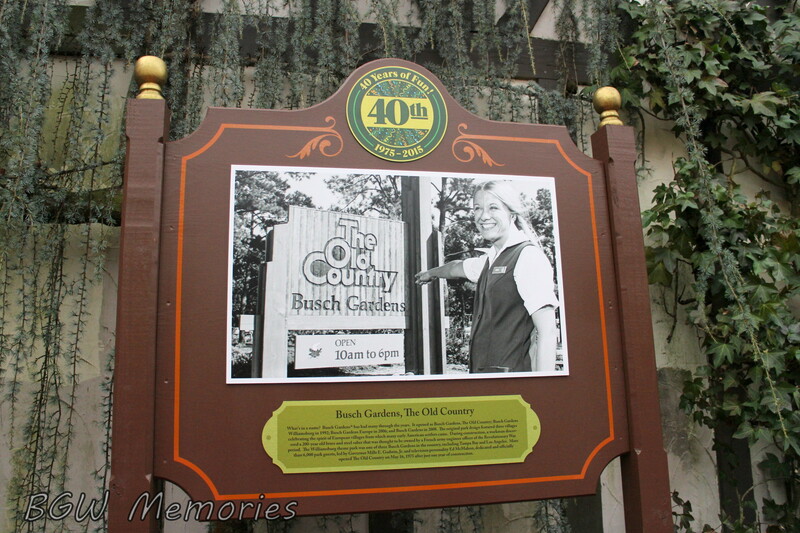 Busch Gardens has had many through the years. 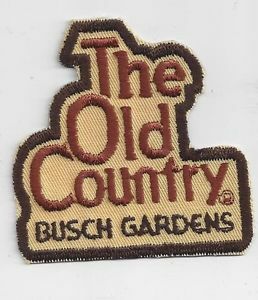 It opened as Busch Gardens, The Old Country; Busch Gardens Williamsburg in 1992; Busch Gardens Europe in 2006; and Busch Gardens in 2008. 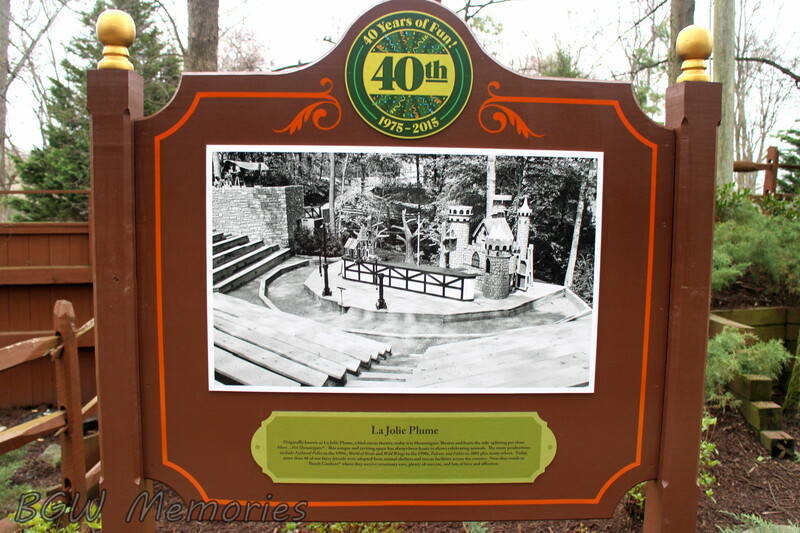 The original park design featured three villages celebrating the spirit of European villages from which early American settlers came. During the construction, a workman discovered a 200-year old brass and steel saber that was thought to be owned by a French engineer officer of the Revolutionary War period. The Williamsburg theme park was one of three Busch Gardens in the country, including Tampa Bay and Los Angeles. 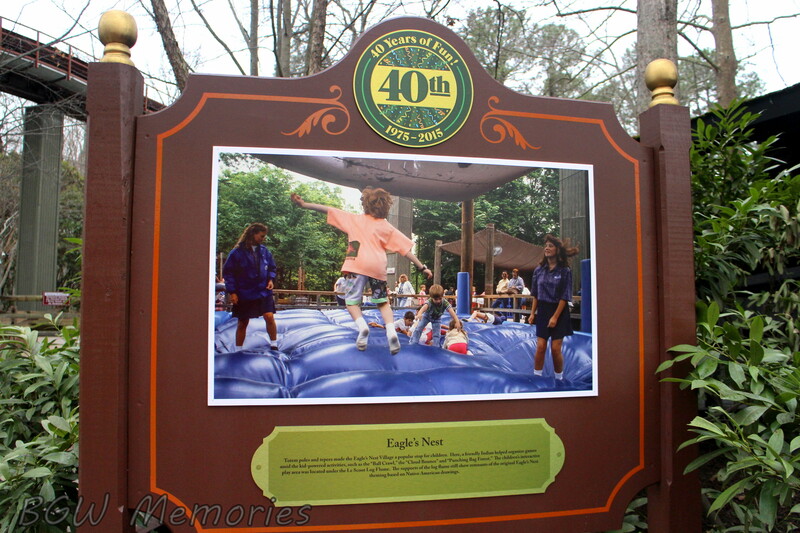 More than 6,000 park guests, led by Governor Mills E. Godwin, Jr. and television personality Ed McMahon, dedicated and officially opened the Old Country on May 16, 1975 after just one year of construction. The Globe Theatre was the park’s largest structure when it opened in 1975, and it continues to host live shows in the double-sized replica of William Shakespeare’s performance space. Through the years, the theatre has featured a variety of extravaganzas from Mark Wilson’s Worlds Greatest Illusions, America on Ice, Hot Ice, Celebrate America to today’s London Rocks, with puppets, animation, and musical performances from classic British bands. 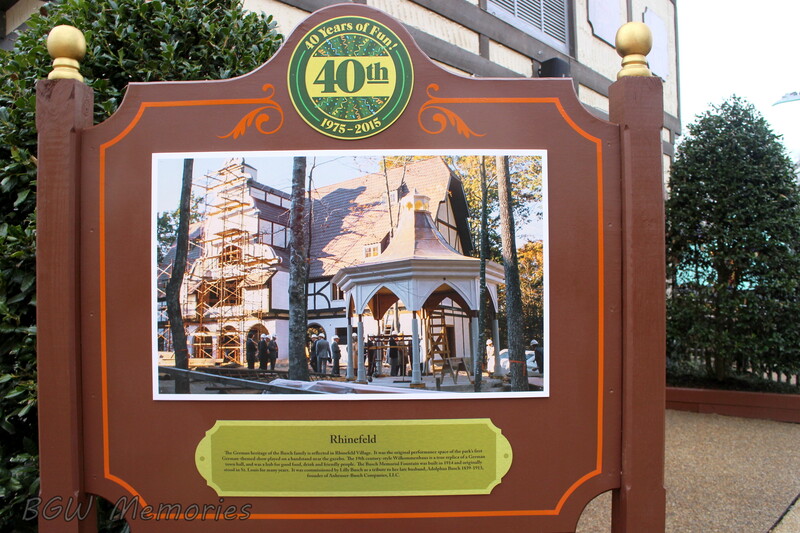 The Bard was a writer for all seasons, and the Globe Theatre showcases many seasonal favorites such as Monster Stomp on Ripper Row, part of Howl-O-Scream and Scrooge No More for Christmas Town. 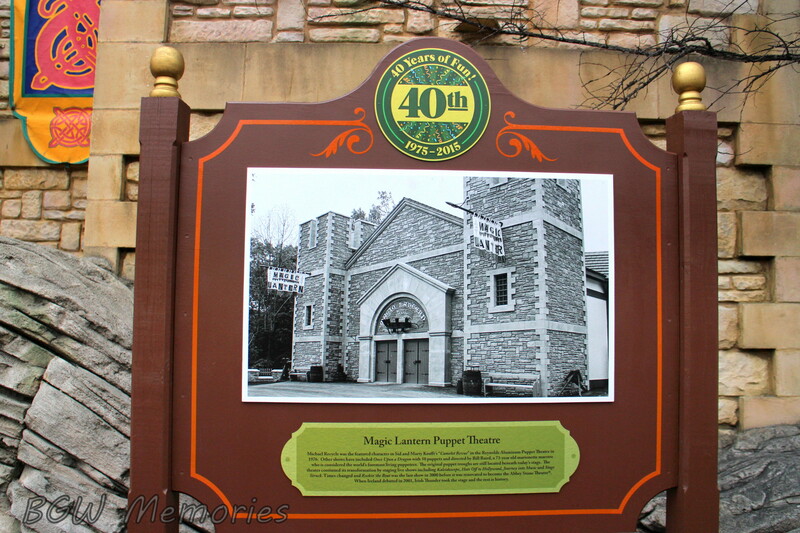 For a time, 4D movies were also shown including Haunts of the Old Country, R.L. Stein’s Haunted Lighthouse and Pirates 4-D.
* I would like to mention two shows; Ghosts of the Globe and Haunts of the Old Country. BGW Memories’ Entertainment Photo Album on Facebook, you may find images of Ghosts of the Globe. From the moment guests arrived to Busch Gardens, they were immersed in the European Theme. 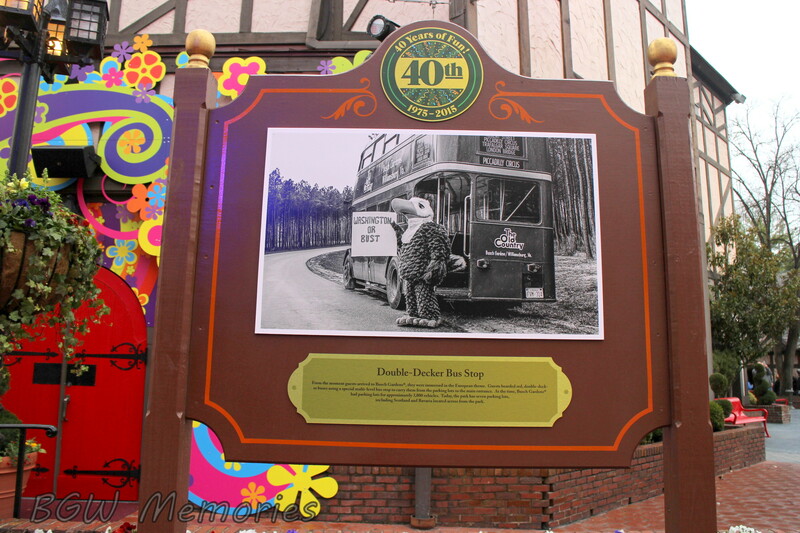 Guests boarded red, double-decker buses using a special multi-level bus stop to carry them from the parking lots to the main entrance. At the time, Busch Gardens had parking for approximately 3,000 vehicles. Today the park has seven parking lots, including Scotland and Bavaria located across from the park. The sky-high mode of transportation provides guests with a three-minute, 3,000 linear foot tour of the “World’s Most Beautiful Park.” Passengers enjoy views of six European countries while traveling nearly 80 feet in the air. It is the most popular ride in the park, and has given more than 75 million rides since the opening in 1975. All Aboard! Passengers travelling to the following destinations: England (Aeronaut Skyride), Aquitaine (Blimp Debarcadere Skyride) and Rhinefeld (Zeppelin landing Skyride). It is the only ride of its type with a triangular layout. The Budweiser Clydesdales were first introduced to the public on April 7, 1933, to celebrate the repeal of Prohibition. The first Clydesdale hitch was given by August A. Busch, Jr. as a gift to his father, August Anheuser Busch, Sr. A Budweiser Clydesdale’s qualifications include having an even temperament, gelded, four years of age, eith hands (72 inches, 183 cm) at the withers when fully mature and weigh between 1,800 and 2,300 pounds (820 and 1,040 kg). 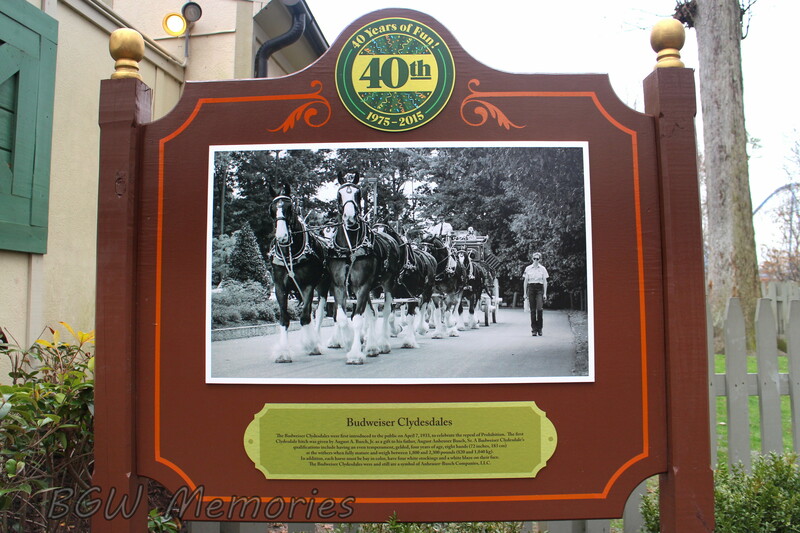 The Budweiser Clydesdale were and still are a symbol the Anheuser-Busch Companies, LLC. When the park opened in 1975, the bridge in Scotland was called Brittany Bridge leading to the medieval English Hamlet of Hastings on the other side. In the main court area there was a “Guess Your Age and Weight,” and the village featured a Battlements shooting gallery, a penny arcade and Turvey Manor Fun House. 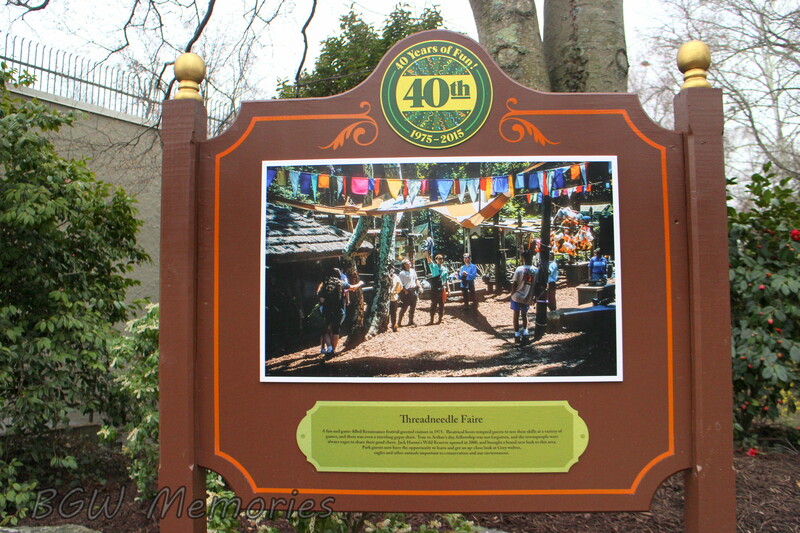 In 2001, Busch Gardens introduced Ireland, Replacing Hastings- the first new country to join the park in 20 years. *Let’s also take a moment to remember the store Wizard Works that had magicians and magical items (Currently it is the store called “Pot O’ Gold.”) The bathrooms next to Wizard Works used to be Rooms of Illusionment and featured two rooms to walk through. One was a body heat reflection and a shadow wall. One could lean up against a wall and a bright light would flash. Moving away from the wall, your shadow was left until it faded and the light would flash again. Michael Recycle was the featured character in Sid and Marty Krofft’s “Camelot Revue” in the Reynolds Aluminum Theater in 1976. Other shows have included Once Upon a Dragon with 50 puppets and directed by Bill Baird, a 73-year old marionette maestro who is considered the world’s foremost living puppeteer. The original puppet troughs are still located beneath today’s stage. The theater continued its transformation by staging live shows including Kaleidoscope, Hats off to Hollywood, Journey into Music, and Stage Struck. Times changed and Rockin’ the Boat was the last show in 2000 before it was renovated to become the Abbey Stone Theater. When Ireland debuted in 2001, Irish Thunder took the stage and the rest is history. This unique and enchanting building was once home to Le Catapult for ten years. The art on the walls looked like a howling storm with crashing waves and dark lightening clouds themed after the Battle of Hastings. 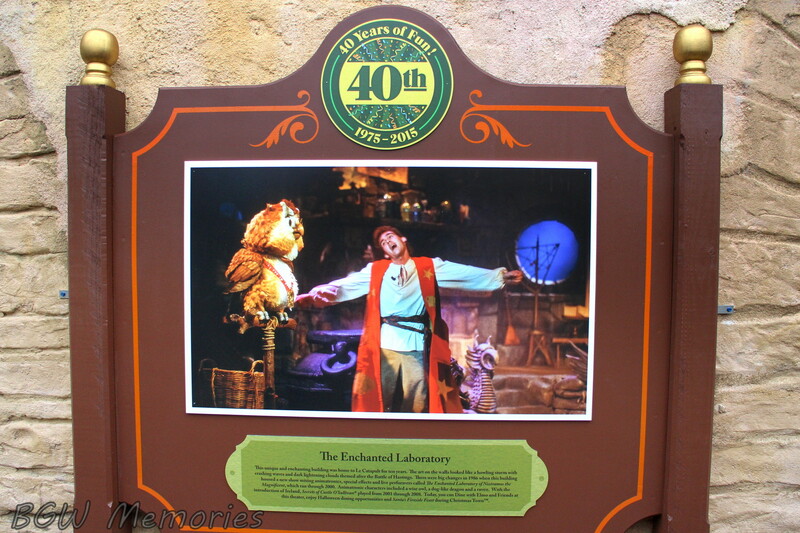 There were big changes in 1986 when this building housed a new show mixing animatronics, special effects, and live performers called the Enchanted Laboratory of Nostramos the Magnificent, which ran through 2000. Animatronic characters included a wise owl, a dog-like dragon, and a raven. With the introduction of Ireland, Secrets of Castle O’ Sullivan played from 2001 to 2008. Today you can Dine with Elmo and Friends at this theater, enjoy Halloween dining opportunities and Santa’s Fireside Feast during Christmas Town. The simulator building was constructed and debuted in 1990. Riding with a gnome-like character, guests traveled as companions that encountered a variety of obstacles during their mission. Questor combined a fast-paced motion picture adventure, with studio animation, special effects, and flight simulations. In 1996, King Arthur’s Challenge replaced Questor and in 2001 Ireland launched and Corkscrew Hill was introduced. A fun and game-filled Renaissance festival greeted visitors in 1975. Theatrical hosts tempted guests to test their skills at a variety of games, and there was even a traveling gypsy show. True to Arthur’s day, fellowship was not forgotten, and the townspeople were always eager to share their good cheer. Jack Hanna’s Wild Reserve opened in 2009, and brought a brand new look to the area. Park guests now have the opportunity to learn and get an up-close look at Grey wolves, eagles and other animals important to conservation and our environment. 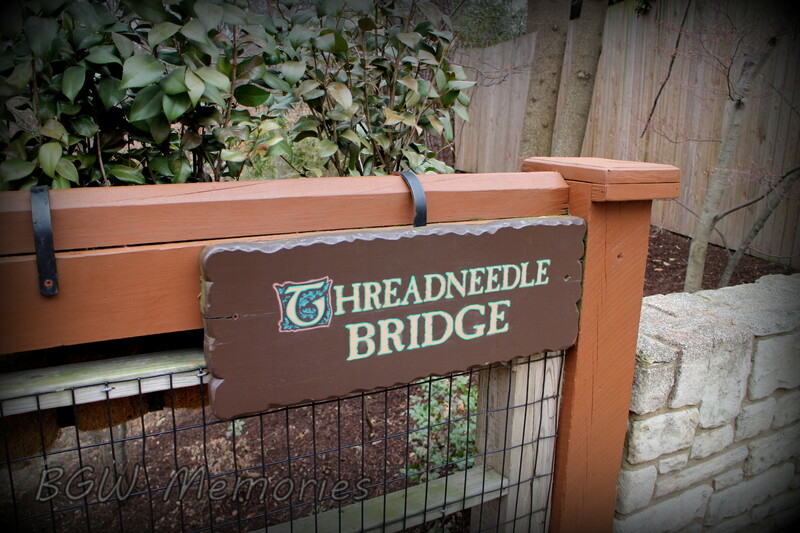 *Make sure to notice the “Threadneedle Bridge” sign while in the area. It’s a little Ghost of the past. Originally known as LaJolie Plume, a bird circus theater, today it is Shenanigans Theatre and hosts the side-splitting More…Pet Shenanigans. This unique and inviting space has always been a home to shows celebrating animals. The many productions featured Feathered Follies in the 1980’s, World of Birds and Wild Wings in the 1990s, Falcons and Fables in 2001 plus many others. Today, more than 40 of our furry friends were adopted from animal shelters and rescue facilities across the country. Now they reside at Busch Gardens where they receive veterinary care, plenty of exercise, and lots of love and affection. When the park originally opened, the eagle-One Monorail transported guests on a 7,150 foot oval track from Busch Gardens to the Anheuser-Busch Hospitality Center. Anheuser-Busch opened the Hospitality Center in 1974 to showcase their products. Guests could watch history videos about the company; receive complimentary samples of beer, and tour the brewery. 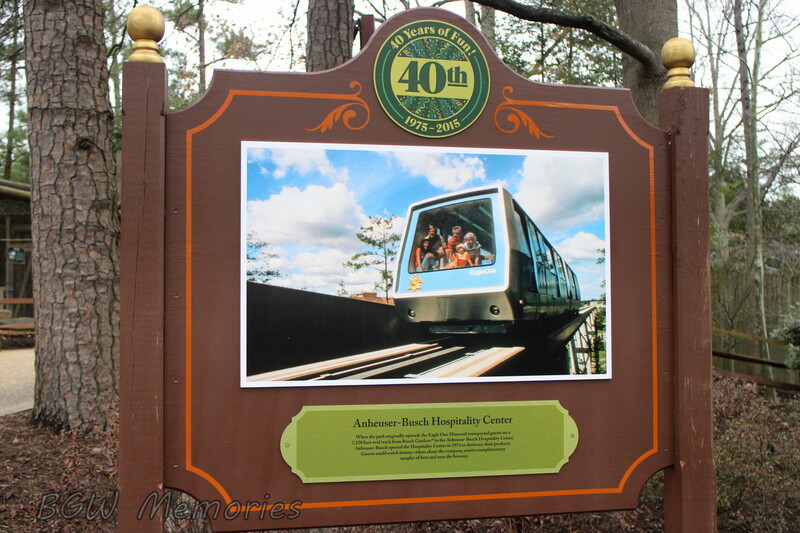 *The best AC in the park was on the Eagle-One Monorail! It was so refreshing on a hot summer day. Not to mention two free beers! Need I say more? This 19th century gypsy wagon, known as the Durton reading wagon, once traveled through the picturesque English countryside. The nameplate reveals A. Hooke Lynn as the original owner while the axle bears the inscription of V.R. Mason, Patent, London 1842. Ash is the primary wood component; however the cabinets and bunks are made from pine. There are touches of spruce and lemonwood while the fancy scroll-work is in a bas-relief. The wagon’s meticulous restoration insured matching the original paint, authenticity of hand forged hardware along with cut glass complete with small bubble imperfections and faults. The original Three Musketeers Theater was a 1,000-seat open-air amphitheater where trained animals performed against a mammoths French castle backdrop on a huge stage, separated from the audience by an authentic moat, which remains under the current stage. A fabric-type net tent provided shade. Today it is known as Le Palais Royal or the Royal Palace Theater. There have been several animal shows over the years, along with Circus Europa, Chinese Acrobats of Taiwan, Imaginique, laser shows, ice spectaculars, and popular concert artists. 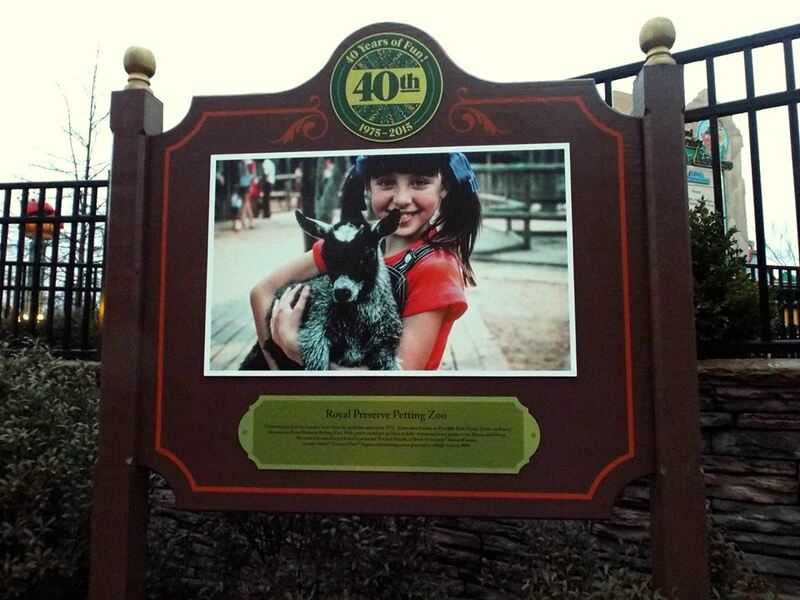 For a brief time, there was even a children’s petting zoo located in the back area. 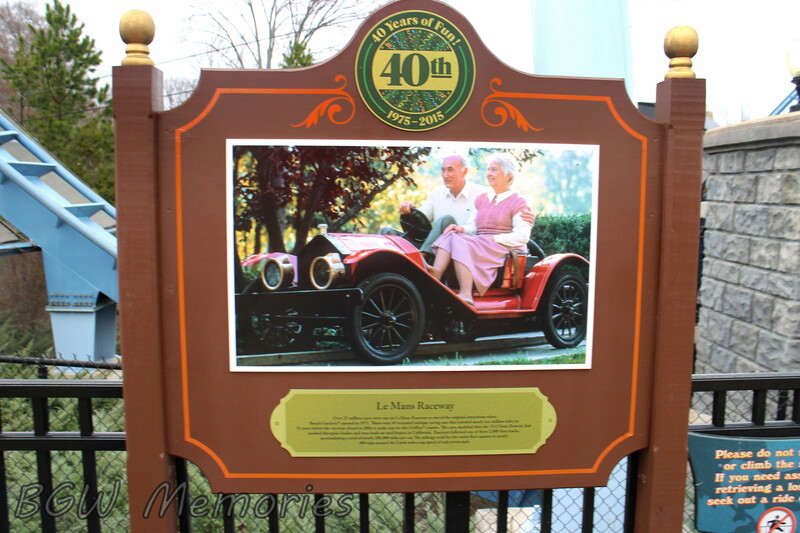 Over 25 million races were run on LeMans Raceway as one of the original attractions when Busch Gardens opened in 1975. There were 49 recreated antique racing cars that traveled nearly ten million miles in 31 years before the raceway closed in 2006 to make way for the Griffon coaster. The cars, modeled after the 1913 Stutz Bearcat, had molded fiberglass bodies and were built on steel frames in California. Racecars followed of o three 2,000-foot tracks, accumulating a total of nearly 200,000 miles per car. The mileage total for the entire fleet equates to nearly 400 trips around the Earth with a top speed of only 7 mph. *Did you know that the original design had the cars going the opposite direction? The straightaway was supposed to replicate the race to the finish. Due to the nature of how cars had to stop at the loading area, it was safer to have the ride end on a large curve to aid in slowing the drivers down. Totem poles and tepees made Eagle’s Nest Village a popular stop for children. Here, a friendly Indian helped organize games amid the kid-powered activities, such as the “Ball Crawl,” the “Cloud Bounce,” and the “Punching Bag Forest.” The children’s interactive play area was located under the LeScoot Log Flume. The supports of the log flume still show remaining remnants of the original Eagle’s Nest theming based on Native American drawings. *I loved this place as a kid. 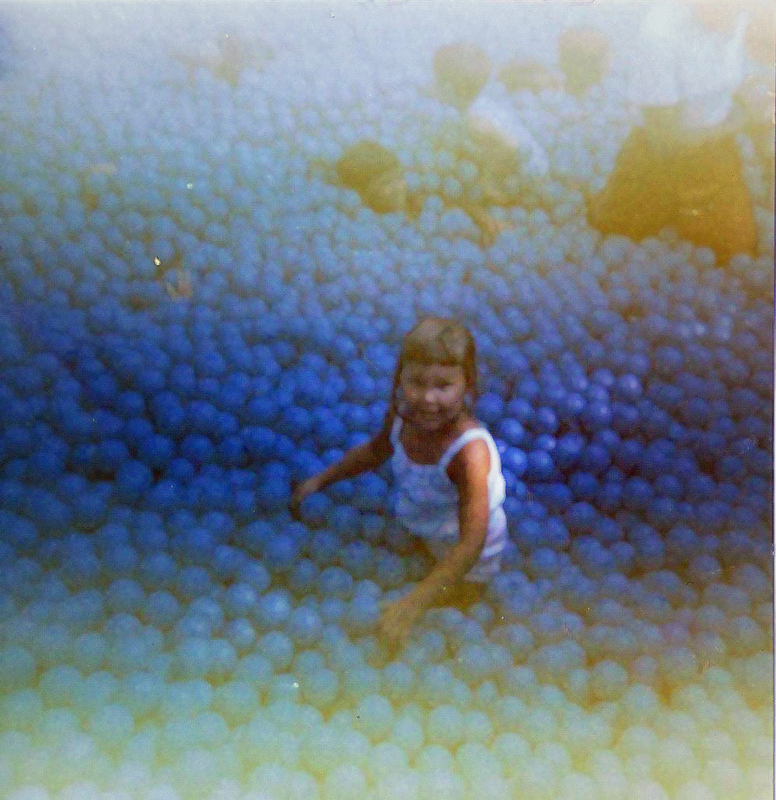 The ball pit was amazing. Sometimes water would splash from the log flume and we loved to wait for the water to fall on those hot summer days. 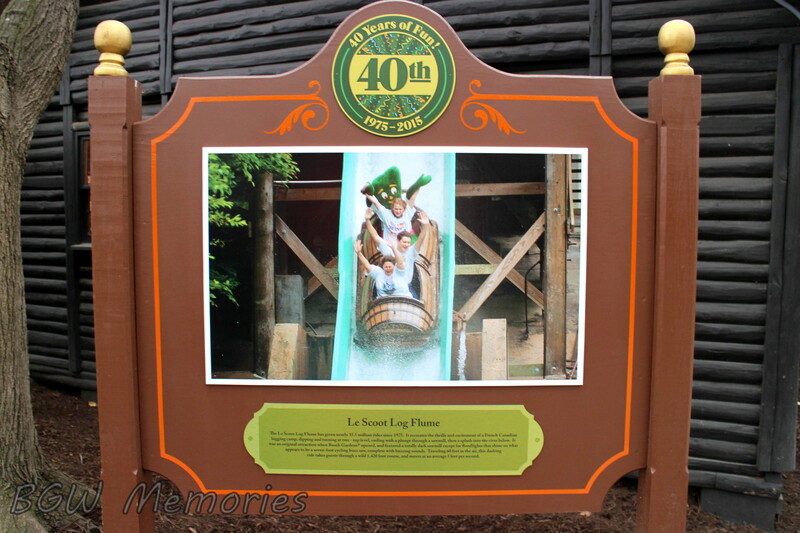 The LeScoot Log Flume has given nearly 35 million rides since 1975. 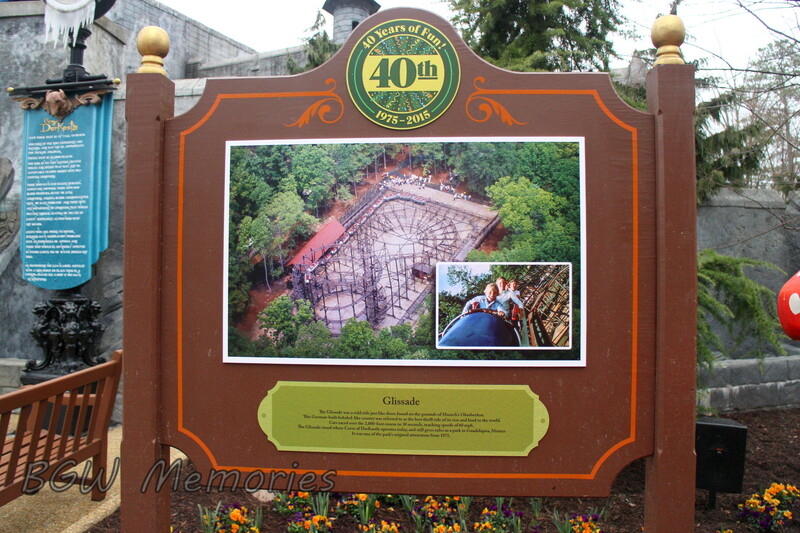 It recreates the thrills and excitement of a French Canadian logging camp, dipping and turning at tree-top level, ending with a plunge through a sawmill, then a splash into the river below. It was an original attraction when Busch Gardens opened, and featured a totally dark sawmill except for floodlights that shine on what appears to be a seven-foot cycling buzz saw, complete with buzzing sounds. Traveling 60 feet in the air, this dashing ride takes guests through a wild 1,420 foot course, and moves at an average 5 feet per second. *This ride used to have two hills. The first dip was removed due to debris pooling at the bottom. It was more efficient to keep the one final drop at the end. The water pump is located behind the Alpengeist, next to the maintenance bay. Water from the ride is drained and recycled each day of operation. 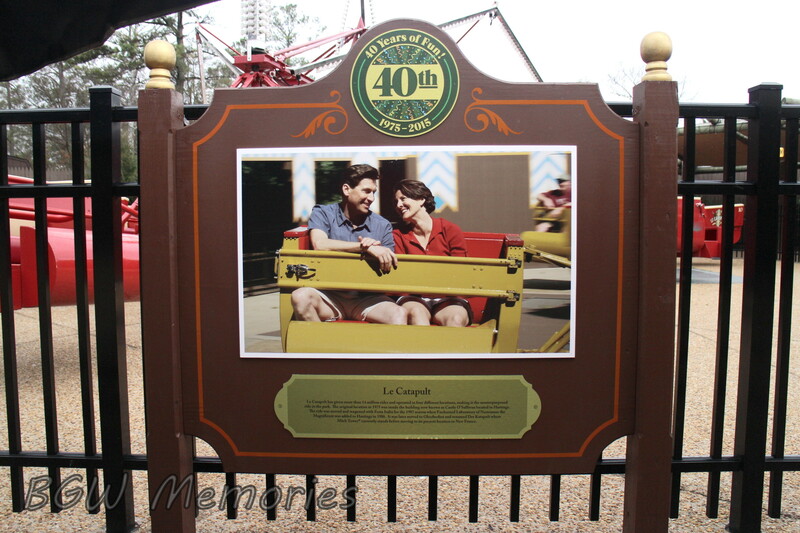 Le Catapult has given more than 14 million rides and operated in four different locations, making it the most repurposed ride in the park. The original location in 1975 was inside the building known as Castle O’ Sullivan located in Hastings. The ride was moved and reopened with Festa Italia for the 1987 season when the Enchanted Laboratory of Nostramos the Magnificent was added to Hastings in 1986. It was later moved to Oktoberfest and renamed Der Katapult where Mach Tower currently stands before moving to its present location in New France. The Palladium has hosted many hit shows since opening with the park in 1975. It is commonly called the Canadian Palladium and has offered bluegrass, country, and dancing performances. At various intervals, the Palladium featured gospel and clogging shows. The Busch Street Boys were featured in 1994, and in 1988 American Jukebox performed at this theater in various forms. Monster Stomp was a new show that debuted for the 2002 Howl-O-Scream season. It was quickly a fan favorite, and provided groundwork for Monster Stomp on Ripper Row which debuted in the Globe Theatre in 2014. 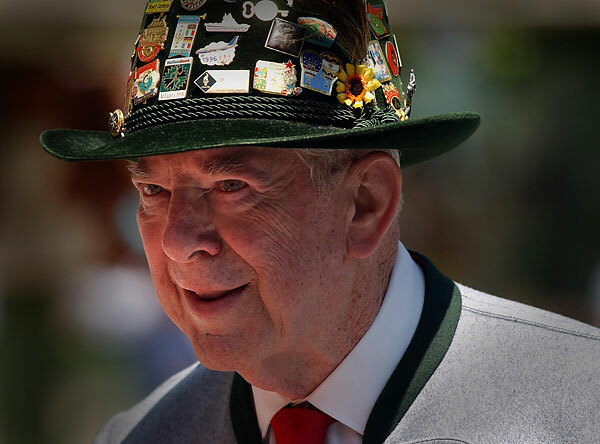 The German heritage of the Busch family is reflected in Rhinefeld Village. 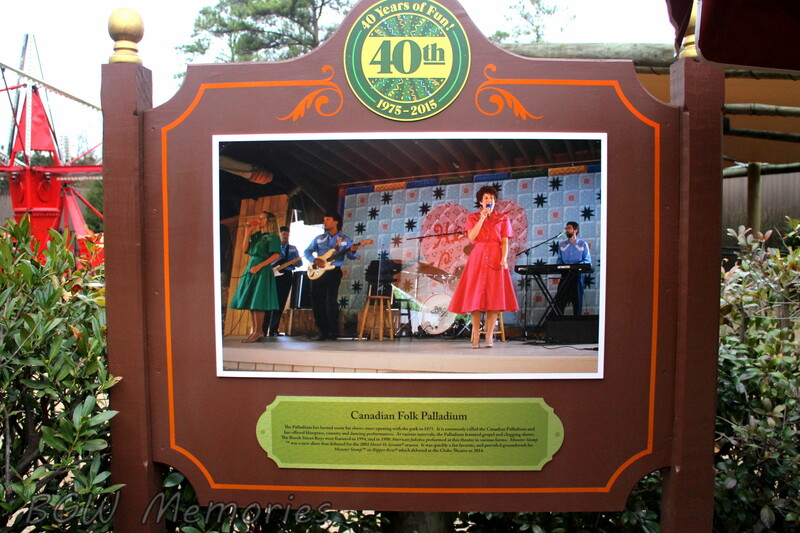 It was the original performance space of the park’s first German-themed show played on a bandstand near the gazebo. The 19th century-style Wilkommenhaus is a true replica of a German town hall, and was a hub for good food, drink, and friendly people. The Busch Memorial Fountain was built in 1914 and originally stood in St. Louis for many years. It was commissioned by Lily Busch as a tribute to her late husband, Adolphus Busch 1839-1913, founder of Anheuser-Busch Companies, LLC. Originally a petting zoo, kids visited and fed baby animals in the nearby forest while adults enjoyed libations at Rhinefeld. 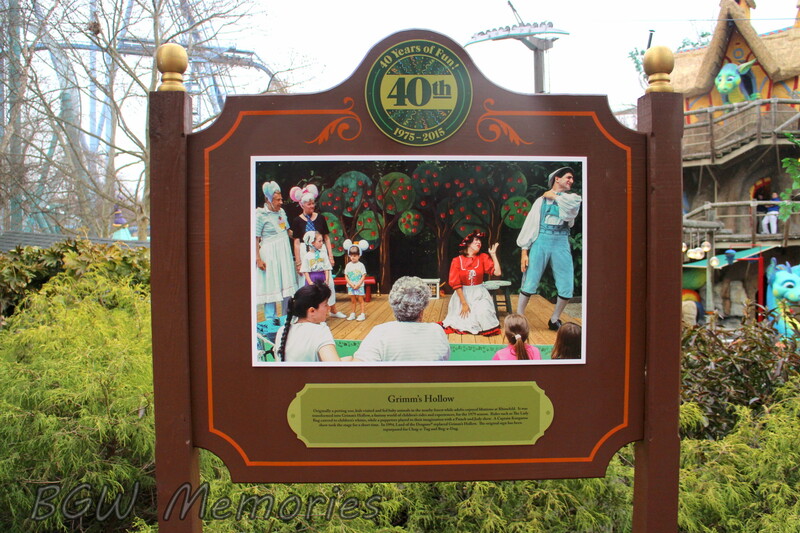 It was transformed into Grimm’s Hollow, a fantasy world of children’s rides and experiences for the 1979 season. Rides such as the Lady Bug catered to Children’s whims, while a puppeteer played to their imagination with a Punch and Judy show. A Captain Kangaroo show took place on stage for a short time. In 1994, Land of the Dragons replaced Grimm’s Hollow. The original sign has been repurposed for Chug-a-Tug and Bug-a-Dug. * Grimm’s Hollow also had a fun sand pit area with a play Gingerbread House and rocking horses. There was a boat ride (still in operation at Land of the Dragons) and a circular buggy and motorcycle ride as well. Park visitors have enjoyed more than 16 million rides on this historic merry-go-round. Allen Herschell, a pioneer of the mobile carousel, built this unit in 1919 in Tonawanda, New York. For more than 50 years, it traveled throughout the United States before being abandoned. 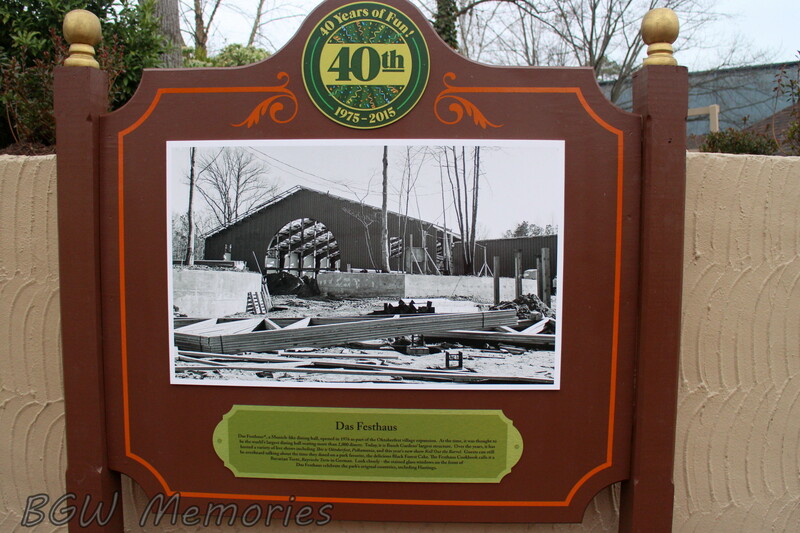 In 1973, Busch Gardens located the dismantled carousel in a Dallas, Texas auction barn. Under the direction of the builder’s grandson, fourteen craftsmen spent six months restoring it to its original condition. All side panels, ponies, castings, and brass rails are either original fittings or genuine Herschell replacement parts. *Technically, this is the oldest ride in the park. 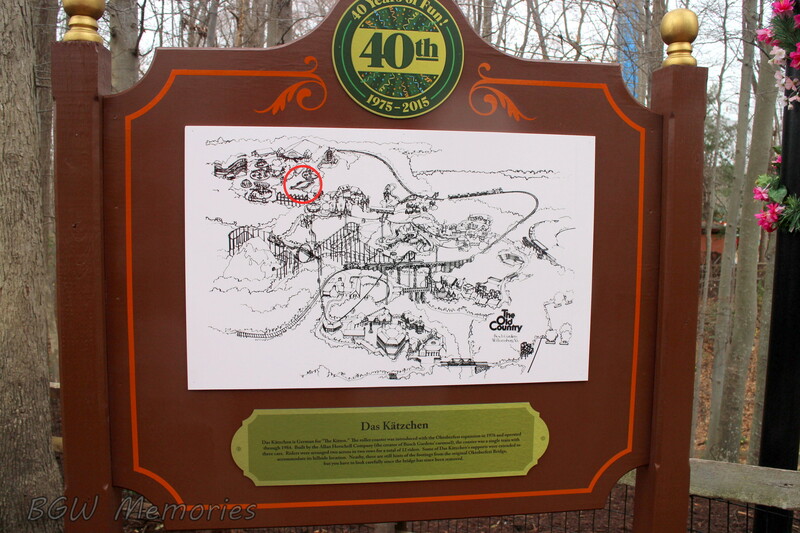 Das Katzchen is German for “The Kitten.” The roller coaster was introduced to Oktoberfest expansion in 1976 and operated through 1984. Built by the Allen Herschell Company, (the creator of the Busch Gardens Carousel), the coaster was a single train with three cars. Riders were arranged two across in two rows for a total of 12 riders. Some of Das Katzchen’s supports were extended to accommodate its hillside location. Nearby, there are still hints of the footings from the original Oktoberfest Bridge, but you have to look carefully since the bridge has since been removed. 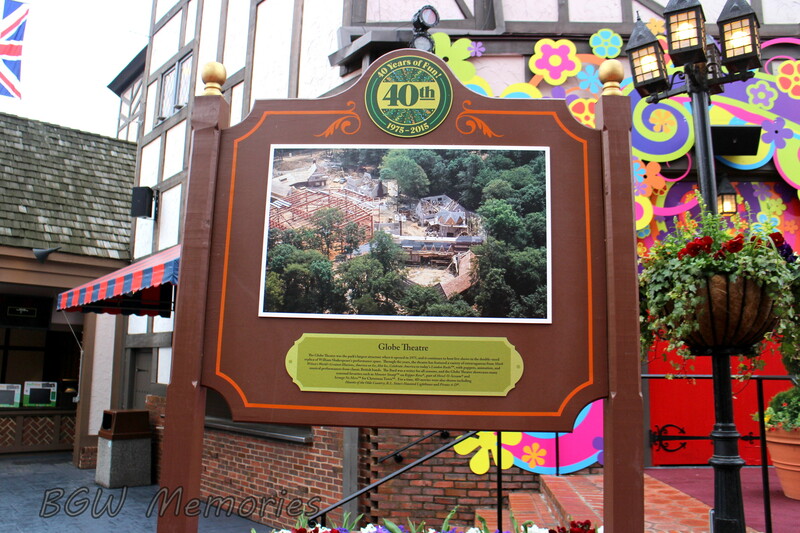 The park soared above its expected attendance in the 1975 operating season, so Oktoberfest, a new section of the German village, was added in 1976. 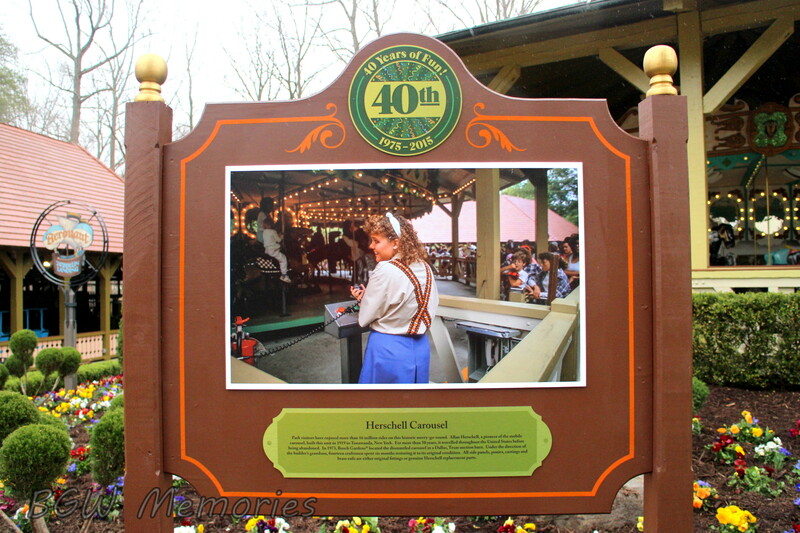 This grand hamlet included a 2,000-seat Munich-like festival hall (where food, drink, and oompah music still abound), several new rides and roller coasters, restaurants, and additional restrooms. Oktoberfest continues to capture the excitement of Munich’s famous street festival. 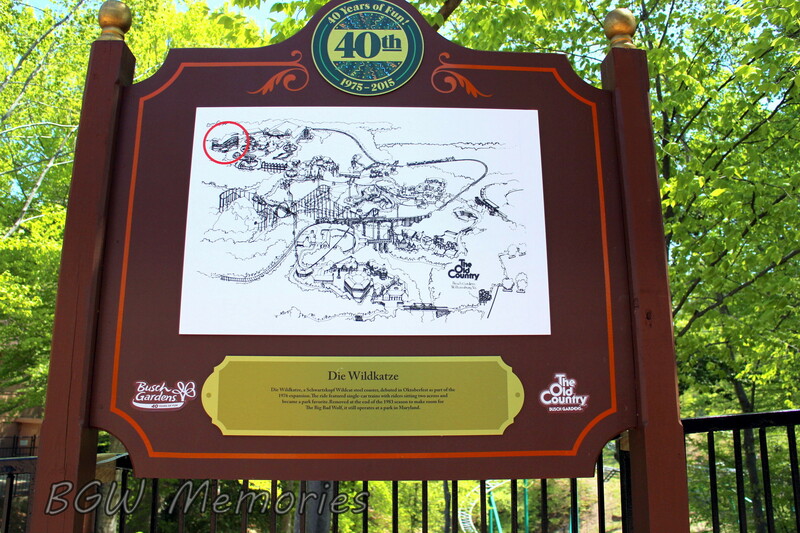 It was the first expansion to the original park layout and originally included Oktoberfest Bridge, since removed. The Glissade was a wild ride just like those found on the grounds of Munich’s Oktoberfest. 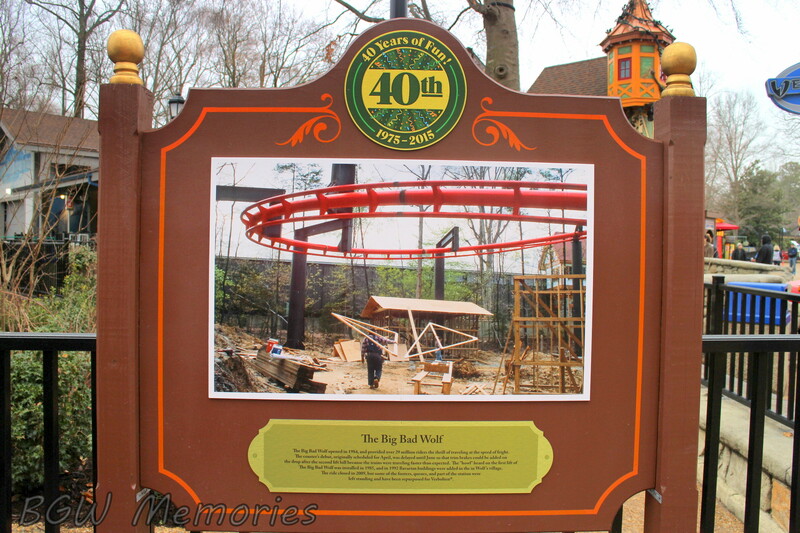 This German-built bobsled-like coaster was referred to as the best thrill ride of its size and kind in the world. Cars raced over the 2,00-foot course in 30 seconds, reaching speeds of 60 mph. The Glissade stood where Curse of Darkastle operates today, and still gives rides in Guadalajara, Mexico. 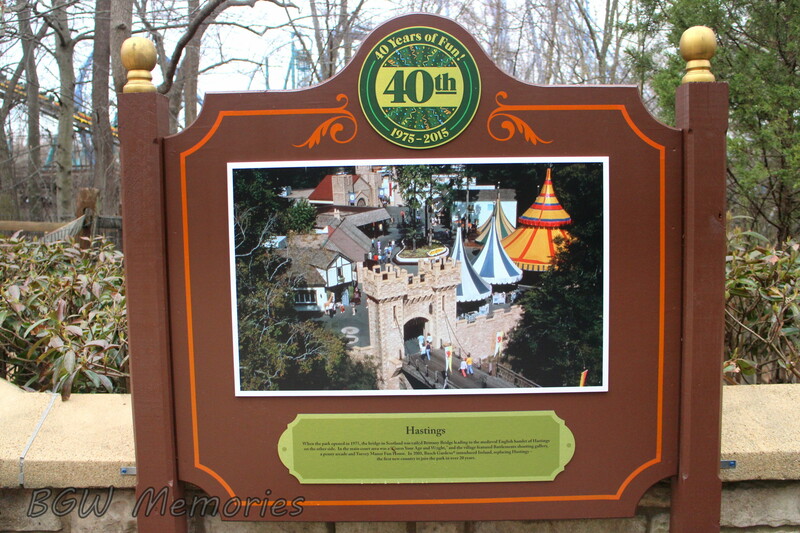 It was one of the park’s original attractions in 1975. Wild Izzy, a steel wild mouse coaster was named after the 1996 Summer Olympic Games mascot. 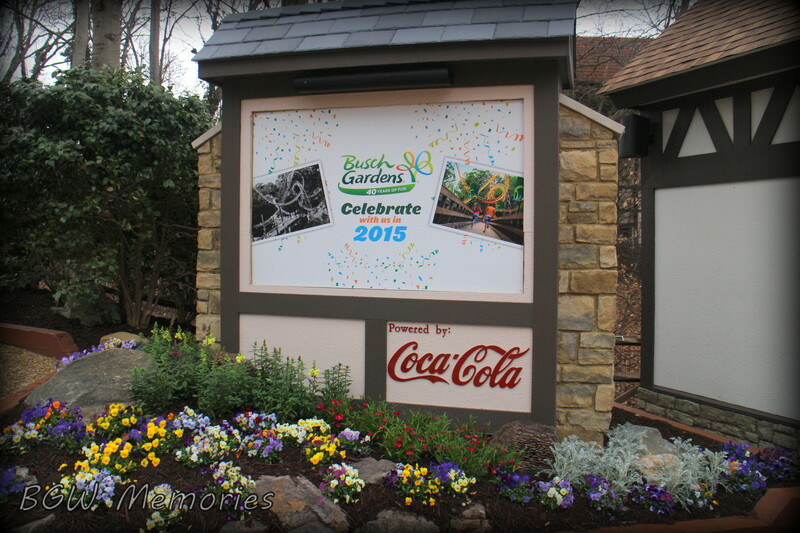 Busch Gardens was a proud sponsor of the 1996 Summer Olympic Games that were played in Atlanta, Ga. 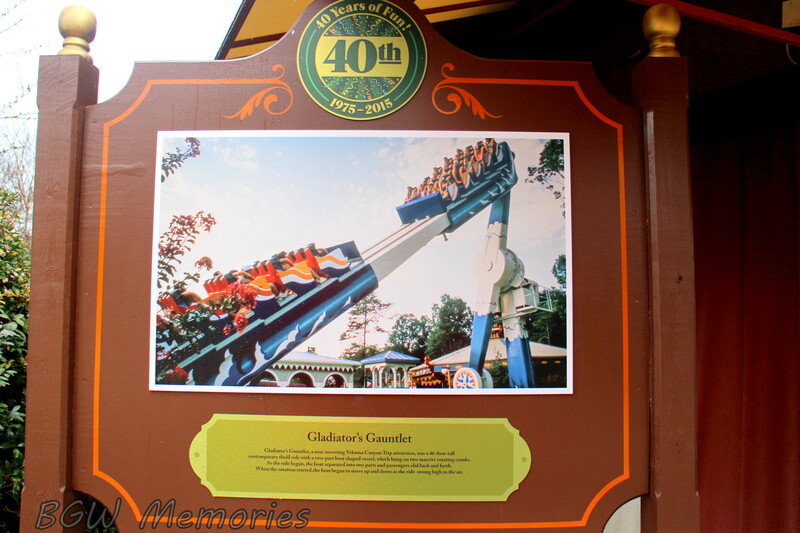 Renamed Wild Maus in 1997 and removed at the end of the 2003 season, it was then relocated to Busch Gardens Tampa and renamed Cheetah Chase. In 2005, Curse of Darkastle opened where Wild Maus once stood. Das Festhaus, a Munich-like dining hall, opened in 1976 as part of the 1976 Oktoberfest Village expansion. At the time, it was thought to be the world’s largest dining hall seating more than 2,000 dinners. Today, it is Busch Gardens largest structure. Over the years, it has hosted a variety of live shows including This is Oktoberfest, Polkamania, and this year’s new show Roll Out the Barrel. 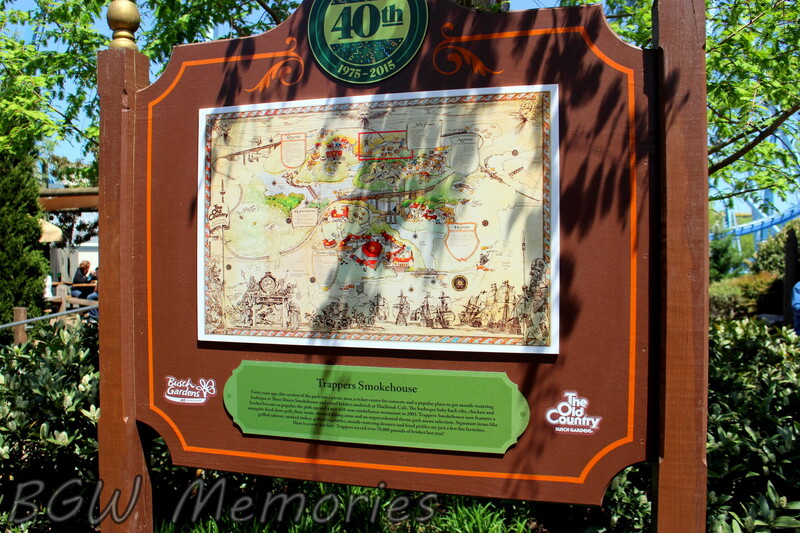 Guests can still be overheard talking about a time they dined on a park favorite, the delicious Black Forest Cake. The Festhaus cookbook calls it a Bavarian Torte, Bayrische Torte in German. Look Closely- the stained glass windows on the front of Das Festhaus celebrate the park’s original countries, including Hastings. Drachen is the German spelling of Dragon and the looping roller coaster, located in Oktoberfest, opened in 1992. Special lighting illuminated the sides of the coaster car in red. When Drachen Fire was completed, it has six inversions; a wraparound corkscrew midway on the first hill, two Cobra Rolls (referred to by Arrow Dynamics as a “Batwing”) and a cutback between the corkscrews. Two counter-clockwise corkscrews completed the count. The ride’s loading station is currently being used for Howl-O-Scream. Die Wildkatze, a Schwartzkopf Wildcat steel coaster, debuted in Oktoberfest as part of the 1976 expansion. The ride featured single-car trains with riders sitting two across and became a park favorite. 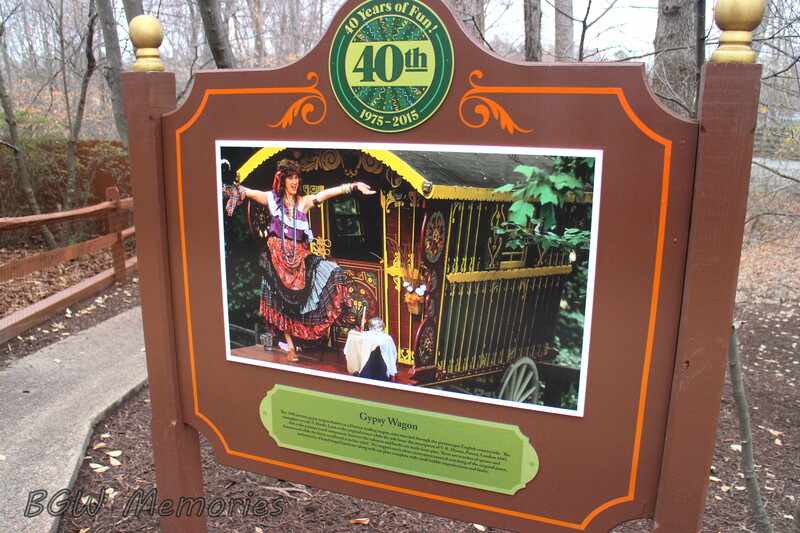 Removed at the end of the 1983 season to make room for the Big Bad Wolf, it still operates at a park in Maryland. The Big Bad Wolf opened in 1984, and provided over 29 million riders the thrill of traveling at the speed of fright. The coaster’s debut, originally scheduled for April, was delayed until June so that trim brakes could be added on the after the second lift hill because the trains were travelling faster than expected. The “howl” heard on the first lift of the Big Bad Wolf was added in 1985, and in 1992 Bavarian buildings were added in the Wolf’s village. The ride closed in 2009, but some of the footers, queues, and part of the station were left standing and have been repurposed for Verbolten. * My friend the Big Bad Wolf, how I miss you. I wrote two stories about the Wolf. Feel free to check them out should you wish to read my thoughts about my favorite ride of all time. The Loch Ness Monster is a myth and a legend, but at Busch Gardens it is real, at least as a roller coaster. More than 53 million rides have been given since its 1978 debut. The Loch Ness Monster was the first double-looping coaster in the world when it opened and is the only one to this day. For the coaster’s 15th anniversary, 20 Elvis impersonators, from the popular movie, The Flying Elvi, parachuted into the park and rode the Loch Ness Monster. It was a day fit for a king. 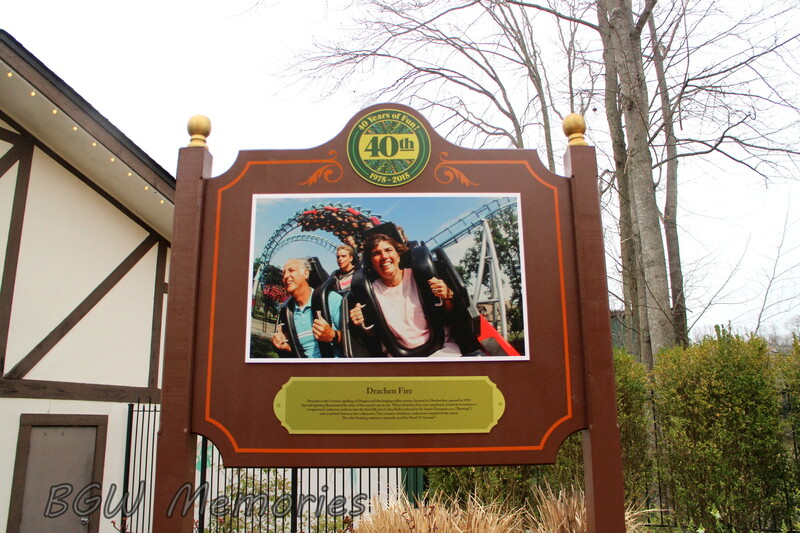 Stretching over six acres, the double-looping steel Arrow Dynamics roller coaster was designed by renowned International Association of Amusement Parks and Attractions Hall of Fame member Ronald Toomer. The Loch Ness Monster was added in 1978 and was the first roller coaster to feature interlocking loops. The American Coaster Enthusiasts (ACE) organization was founded at this coaster. History was made in 2003, when ACE designated the Loch Ness Monster as a historically significant ACE Coaster Landmark. *For the 20th anniversary, the park added growling sounds, strobe lighting, and a face of the Loch Ness that flashed right before you as you exited the cave; conveniently timed to misters that went off right at that exact moment. Those special effects have since been removed. All aboard! 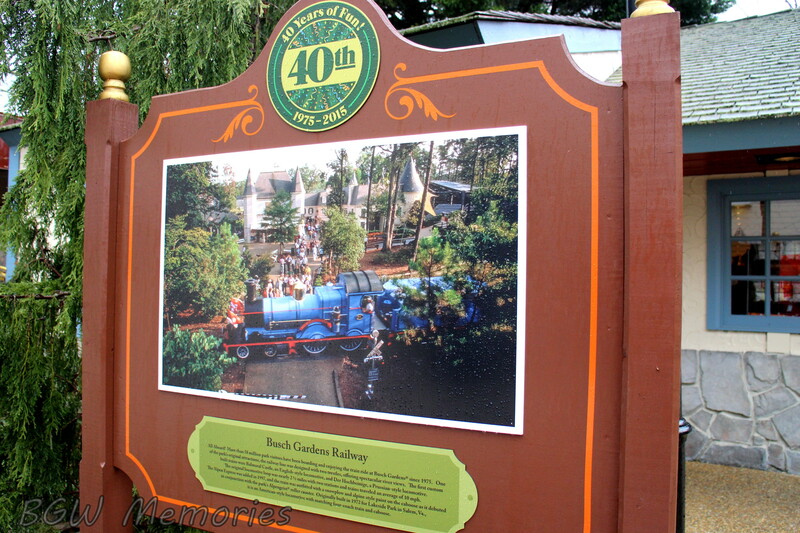 More than 58 million park visitors have been boarding and enjoying the train ride at Busch Gardens since 1975. One of the park’s original attractions, the railway line was designed with two trestles, offering spectacular views. The first custom built trains were Balmoral Castle, and English-style locomotive, and Der Hochbeinige, a Prussian-style locomotive. The original locomotive loop was nearly 2 ½ miles with two stations and trains traveled an average of 10 mph. The Alpen Express was added in 1997, and the train was outfitted with a snowplow and alpine style paint on the caboose as it debuted in conjunction with the park’s Alpengeist roller coaster. Originally built in 1972 for Lakeside Park in Salem, VA it is an American style locomotive with a matching four-coach train and caboose. 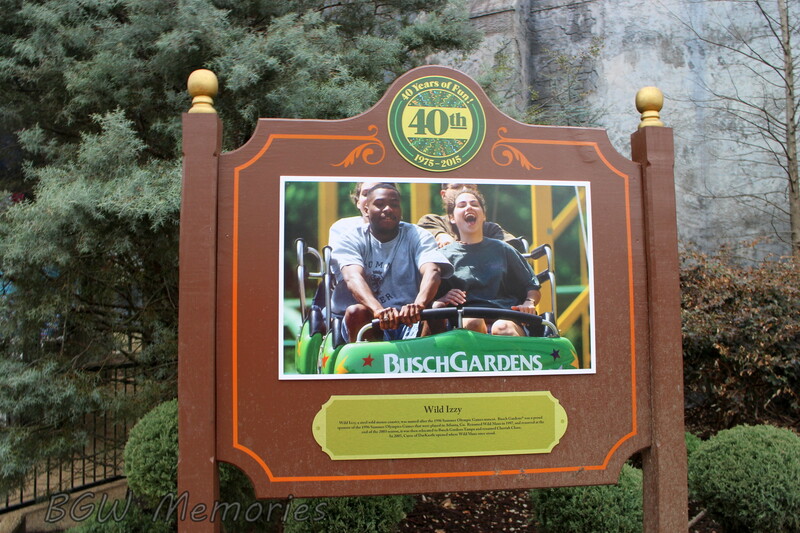 Since 1990, Busch Gardens has been consistently voted the “World’s Most Beautiful Theme Park” by the National Amusement Park Historical Association. When original built in 1975, care was taken to preserve the mature landscaping and natural terrain of the parl. Some of the trees on site are over 400 years old. 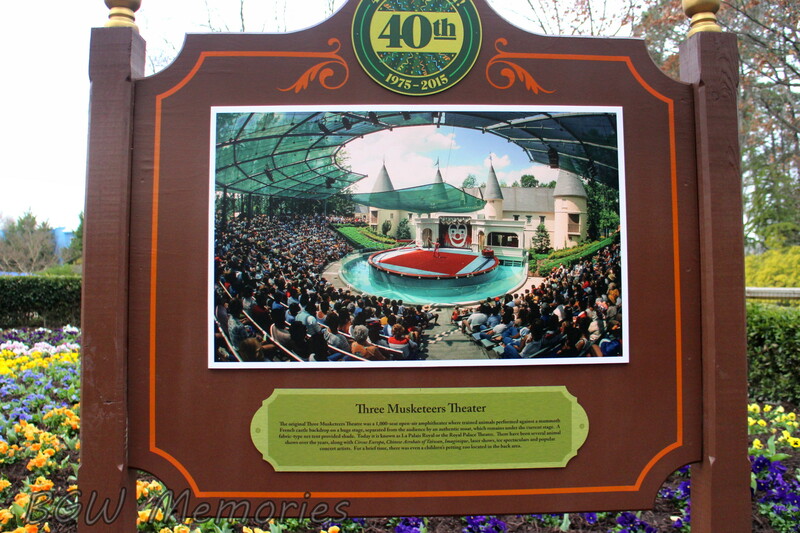 To this day, the park carefully stays true to its European style theme and landscaping. Grooming, watering, and replacing plants takes place daily prior to opening. There are more than 250 flowerbeds, 150 hanging baskets, and 1,000 planters throughout the park. Festa Italia was added in 1987, adjacent to the Italian village of San Marco. Themed around the fair celebrating Marco Polo’s return to Italy from his famous visit to China, it contains many of the park’s midway games, all with a fun and festive theme. The big attraction was the Gladiator’s Gauntlet, along with five additional rides all housed in open air-pavilions and each depicting a country visited by Marco Polo. The expansion also included Festa Station, the third stop on Busch Gardens Railways. Gladiator’s Gauntlet, a non-inverting Vekoma Canyon Trip attraction, was a 46-foot-tall contemporary thrill ride with a two part boat shaped vessel, which hung on two massive rotating cranks. As the ride began, the boat separated into two parts and the passengers slid back and forth. When the rotation started the boat began to move up and down as the ride swung high in the air. The Sea Dragon was a Mack Sea Storm ride, featuring a center water fountain. It was removed in 1998 to make way for Apollo’s Chariot. 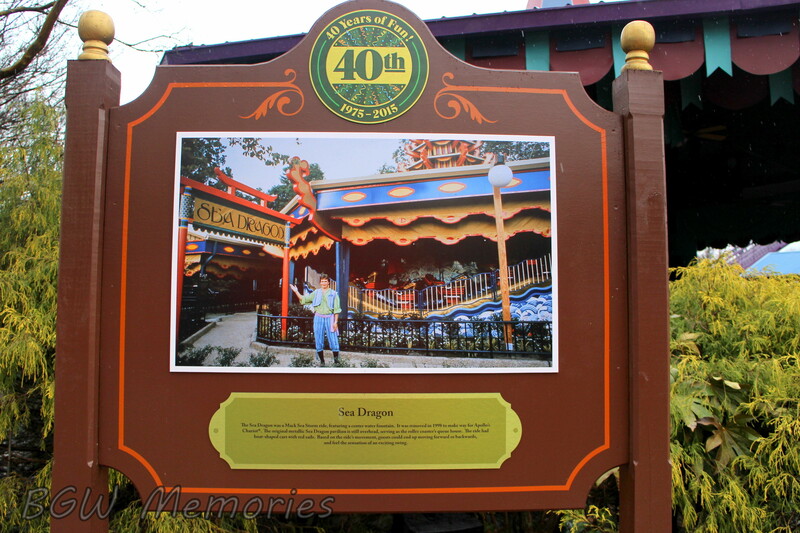 The original metallic Sea Dragon pavilion is still overhead, serving as the roller coasters queue house. The ride had boat-shaped cars with red sails. Based on the ride’s movement, guest could end up forward, backwards, and feel the sensation of an exciting swing. * This ride was extremely fun for its small size. There was also a feature that allowed the boats to turn horizontally to face the fountain. Sometimes the boats would turn in a way that had you facing the other riders. It was always fun to wave to them before the boats turned again. From someone who worked the controls, I was told these turns were initiated by the ride operator at their command. 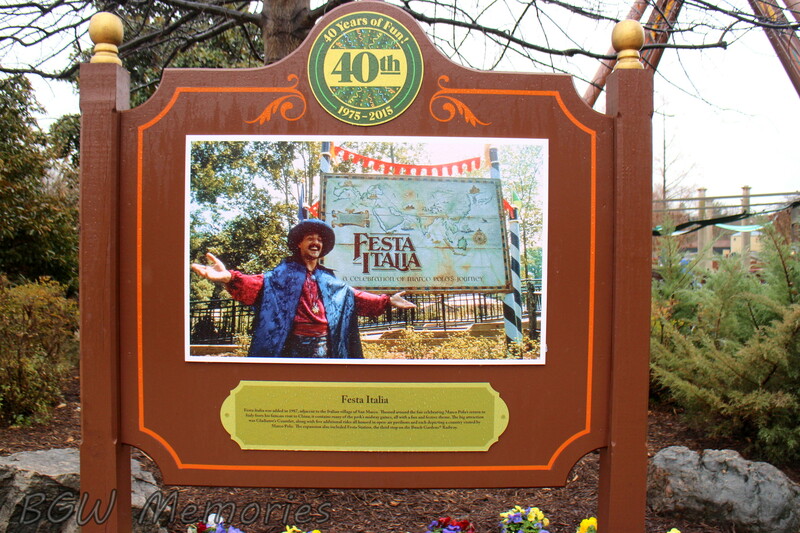 Introduced in 1980, Italy was the first new country added to Busch Gardens expanding the park’s footprint and offering guests another taste of the European experience. Known as San Marco, it is a recreation of a 17th century Italian hillside village and covers nine acres. It completed the outer circle walkway around Busch Gardens. Included in Italy is Leonardo’s Garden of Invention which pays tribute to the genius of the 15th century artist and inventor Leonardo de Vinci. *The Battering Ram, Balloons, and the Flying Machine all opened together. The Gliders and Da Vinci’s Cradle were added later. The Balloons were originally located where Da Vinci’s Cradle is now. An original attraction when the park first opened, the cruise line has given more than 15 million rides. As cruise boats wind through the 65-acre man-made river, riders enjoy a tranquil and relaxing experience. The original seven boats were modeled after the early Rhine passenger steamers and had large nonfunctional side wheels. Today, the park has three boats. The photo from 1974 shows the trestle before the river was filled. *Nothing to add but just to say that this picture is amazing. 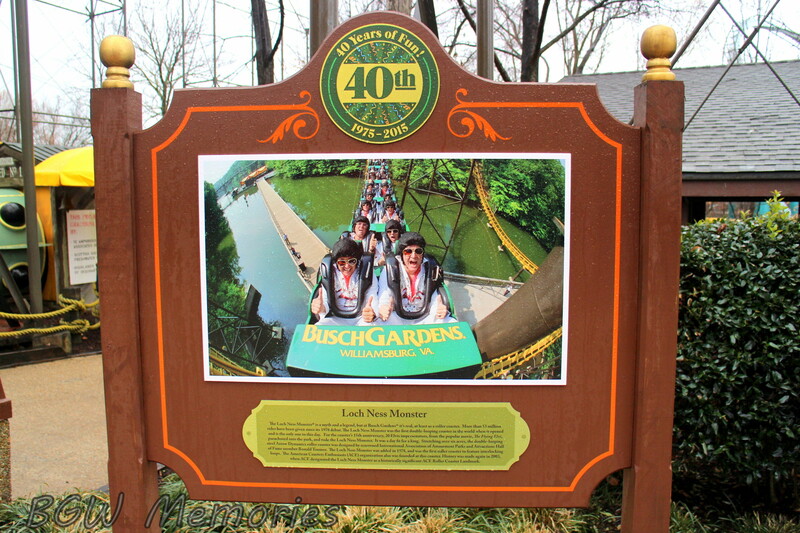 It is hard to imagine a time where there was no “Rhine River.” Of course it is hard to imagine a time without Busch Gardens as well. Thank goodness I was born right after the park opened! Forty years ago, this section of the park was a picnic area, a ticket center for concerts and a popular place to get mouth-watering barbeque at Three Rivers Smokehouse and a beef brisket sandwich at Mackinak Café. The barbeque baby back ribs, chicken, and brisket became so popular; the park opened a new 650-seat smokehouse restaurant in 2003. Trappers Smokehouse now features a mesquite-fired show grill, three rustic-themed dining areas and an unprecedented theme park menu selection. Signature items like grilled salmon, smoked turkey, grilled vegetables, mouth-watering deserts, and fried pickles are just a few fan favorites. Here is a tasty fun fact: Trappers served over 70,000 pounds of brisket last year! 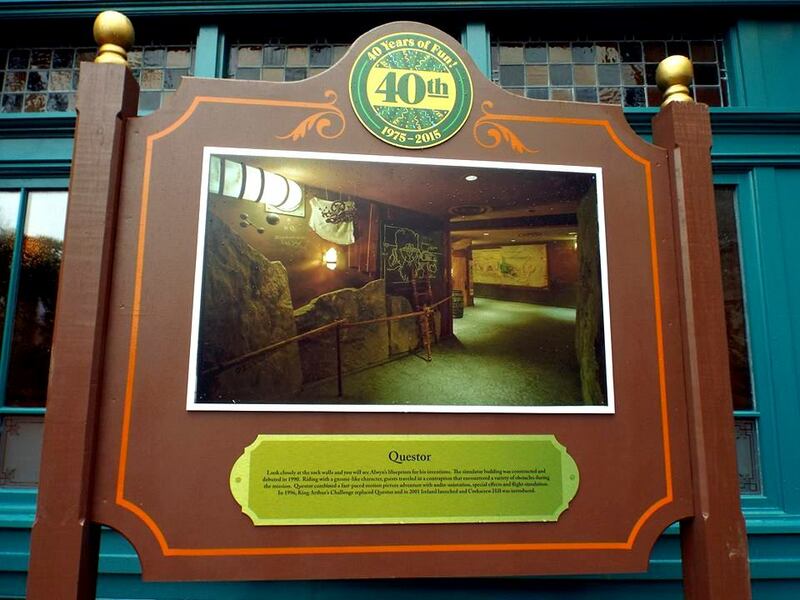 Did you know there is a 40th sign located next to the administration building behind the scenes? 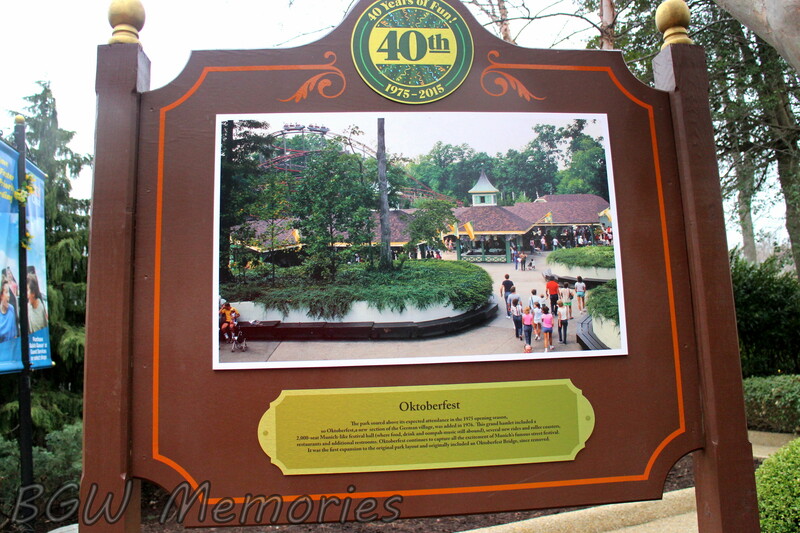 The wording is the same as the first sign you encounter entering the park and features the original 1975 park map instead. 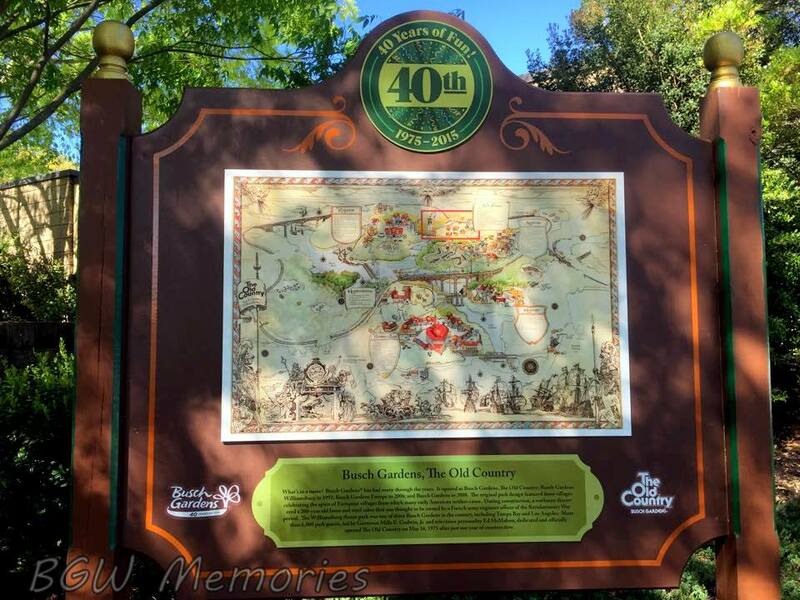 I find this a beautiful way for park administrators and team members to reflect on the long standing history of Busch Gardens Williamsburg and how they are now part of park history. Thank you to all who have worked there in the past and those there today. 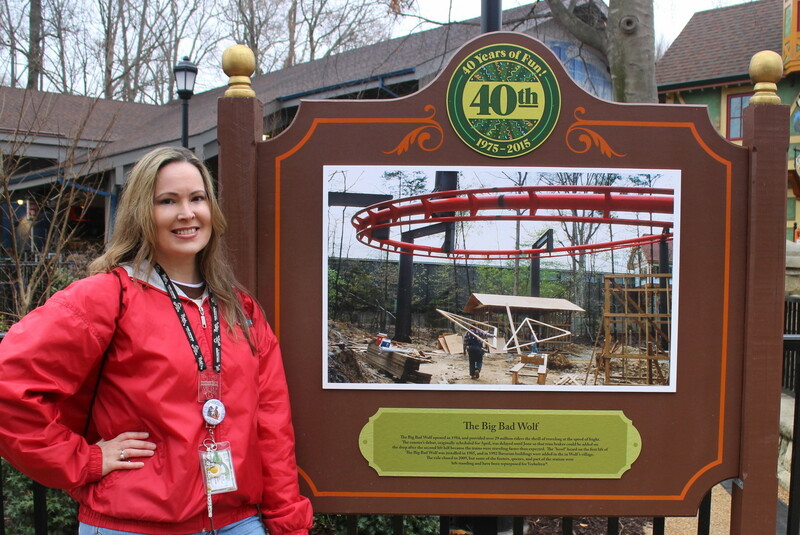 Your hard work and efforts to provide Virginia with the World’s Most Beautiful Theme Park is greatly appreciated! Well, I hope you enjoyed a look through memory lane. 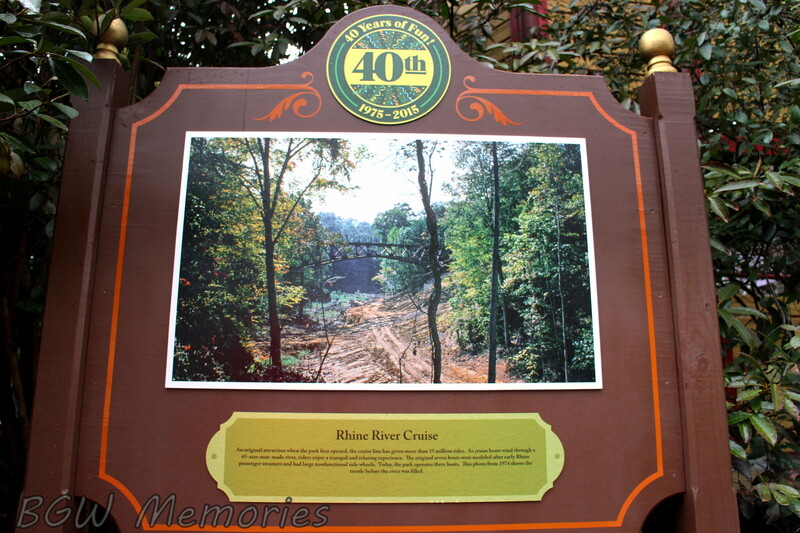 Please feel free to share your memories and photos here at BGW Memories. Together, we all put pieces of a very large theme park puzzle that is enjoyed by generations of enthusiasts just like you.